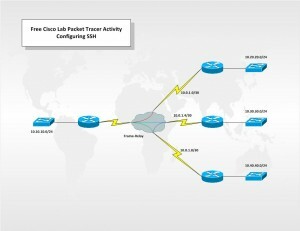 In this lab scenario you will learn to configure SSH (Secure Shell) on four routers connect together via Frame-Relay. The Frame-Relay is configured as hub and spoke with R1 as the hub and R2, R3, R4 as the spokes. Secure Shell or SSH is a network protocol that allows data to be exchanged using a secure channel between two networked devices. Traditionally, remote administrative access on routers was configured using Telnet on TCP port 23. However, Telnet was developed in the days when security was not an issue. For this reason, all Telnet traffic is forwarded in plain text. SSH has replaced Telnet as the best practice for providing remote router administration with connections that support strong privacy and session integrity. SSH uses port TCP 22. It provides functionality that is similar to that of an outbound Telnet connection, except that the connection is encrypted. With authentication and encryption, SSH allows for secure communications over an insecure network.